The 2019 SXSW Film Festival is only a few days away! Are you ready? Don’t sweat it if you aren’t, we have you covered with everything you need to know! In case you missed it, we recently announced our Closing Night Film Pet Sematary plus Midnighters, Shorts & more. Explore our venues, online schedule, how to attend a film screening and more below. Before your SXSW 2019 adventure starts be sure to download the SXSW GO App and activate your account. You can try chatting with Abby, the official SXSW Chatbot to get schedule recommendations and discover new music, films, and sessions on the app to add directly to your schedule. To expedite the badge pickup process upload your photo to your SXSW Social account ahead of time! During the event, lines can be tricky to navigate! Learn more about access and line procedures for 2019 Film Festival screenings. This year we’ve made it easy for you to check the current status of a venue’s remaining capacity. A Green-Yellow-Red system appears on SXSW GO, on the sxsw schedule, and on the large digital Event Status Boards around venues. Admission is subject to capacity. If there’s a screening or session you are particularly excited about, request a SXXpress Pass. Jump to the head of the line with a SXXpress Pass! New for 2019, registrants with Platinum, Interactive, Film, and Music Badges are able to request priority access to individual Conference sessions and parties, Music Festival Showcases, Film Festival Screenings, and Comedy Festival Showcases. Please note that The Paramount Theatre and Stateside Theatre have a new bag size limit! Before you get in line for screenings at these historic landmarks make sure your bag will be allowed inside! Take a look at our handy Film Venues Walking Map and Film Venues Shuttle Route for getting around the Festival. Please note, our Satellite Venue: AFS Cinema is not on the shuttle route. This year’s Film program encompasses 134 Feature Films including 101 World Premieres, 9 North American Premieres, 3 US Premieres, and 64 films from first-time filmmakers, 101 Short Films (including music videos), 5 Episodic Premieres, 12 Episodic Pilots, 25 Virtual Cinema Projects, and 30 Title Design entries. Take a look at the entire lineup and check out the 2019 Film Pocket Guide below. The Film Festival hosts screenings across nine unique venues from the striking Zach Theatre to the Atom Theater, conveniently located inside the Austin Convention Center. If you haven’t started building your film schedule yet, what are you waiting for? Browse by date, venue, or screening section! Learn more about the films selected for the 2019 SXSW Film Festival with our Filmmaker In Focus series! Read interviews with directors and discover their motivations, inspirations, and more for wanting to share these incredible stories. We’re looking forward to seeing you at SXSW 2019! If you still haven’t purchased your badge for SXSW 2019, there’s still time to join us! Register to attend and book your hotel to begin your SX adventure and help us write the next chapter of SXSW from March 8-17. The Film Badge gets you primary access to all SXSW Film events including Film Keynotes and Featured Sessions, world premieres, round tables, workshops, parties, and more. 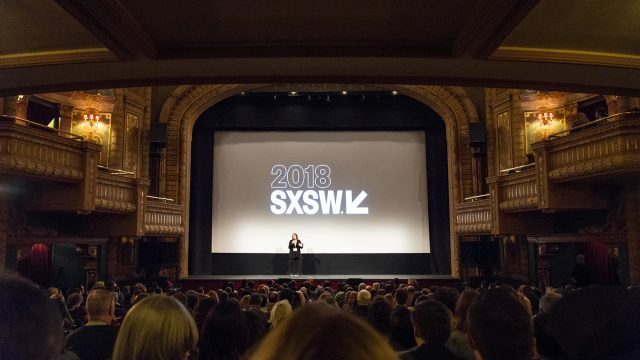 Over the course of nine days, the SXSW Film Festival hosts over 450 screenings!